Decorate your dollhouse in exactly the style you want by making the items yourself. 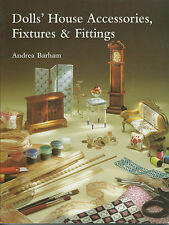 Dolls' House Accessories, Fixtures & Fittings -ISBN 1-86108-103-0 by Andrea Barham. 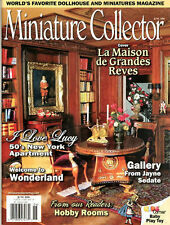 Miniature Collector Mag M/J 1995 Desserts (Cakes), Chairs, Toys, Flora Gill Jacobs Collection, Joan Warren's Collection. 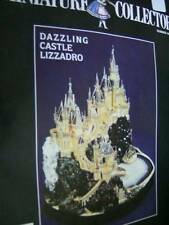 Miniature Collector Mag Summer 1991 Castle Lizzadro, Caravans, Knights Of The Golden Fleece. This is for very good condition Miniature Collector Mag Summer 1991 Castle Lizzadro, Caravans, Knights Of The Golden Fleece and much more. 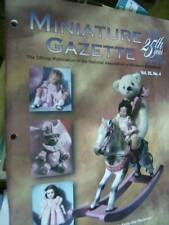 Miniature Gazette Mag Summer 1997 Lamb, Sailboat, Teddy Bear Jumping Jack, Broomstick Pony, Coaster & Glitter Heart Topiary Projects. 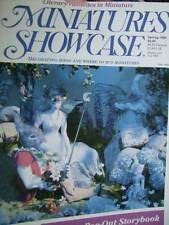 Miniatures Showcase Mag Spring 1992 Pop-Out Storybook, Literature, Midsummer Night's Dream Cover, Judy Smith Profile. Antique 1800s Ivory Doll House Furniture. It is an original, not a copy or reprint. Pictures of antique wooden doll house dolls shown with furniture. 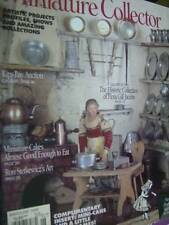 A great reference for antique doll house furniture collectors, dealers, owners and historians. Remco Littlechap Family Doll House Dolls & Furniture. A great reference for Littlechap Family collectors, dealers, owners and historians. It is an original, not a copy. Full color photograph, historical background and marketing information. Designer: Pat Midkiff. 1:12 Scale. cover back corner bent. Antique 1850s Kestner Doll House Furniture. A great reference for antique Kestner doll house furniture collectors, dealers, owners and historians. It is an original, not a copy or reprint. Over the years they will provide facts not available on the open market. Antique Gottschalk Paper Over Wood Doll House. A great reference for antique paper-over-wood dollhouse collectors, dealers, owners and historians. It is an original, not a copy or reprint. Over the years they will provide facts not available on the open market. Two handcrafting doll house furniture and accessories books MINI DRESSINGS for MINI ROOMS, by Jackie Stephens (1976) a how to book on making drapes, curtains, bedspreads, and other accessories for the bedroom and nursery. Dollhouse Miniatures Miniatures Showcase Magazines Spring 91 - Winter 1991, WHOLE SET Set of 4 USED magazines. normal wear and tear, Sold AS IS. I am downsizing a large collection so check back often. BOOKhelping to identify the famous Hacker toys!!! INCLUDE 5 OLDER DOLLHOUSE CATALOGS FROM VARIOUS MINIATURE COMPANYS THESE ARE THE CATALOGS THAT THE COMPANIES SUPPLIED TO THE RETAILERS . THIS LOT INCLUDES 2 CATALOGS FROM AZTEC MINIATURES 2 CATLOGS FROM CARRIAGE HOUSE AND ONE SUPPLEMENT FROM HAND AND HEART. THEY INCLUDE FURNITURE LIGHTING ACCESSORIES ,WICKER AND PLANTS , GREAT REFERENCES. It is an original, not a copy or reprint. 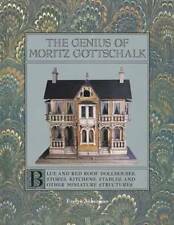 A rare reference for doll house miniatures, collectors, dealers, owners and historians. Over the years they will provide facts not available on the open market, especially for doll historians and researchers. Perfect in room box, dollhouse coffee table or a book shelf in your miniature scene. Suitable for 1:12 dollhouse. 6pcs/Set Dollhouse Book (Random Pattern). The books have printed cover, fixed and can t be open. Published in 1976 as part of the Dover Needlework Series. "Contains 37 rug designs charted for easy use on #18 and other-size needlepoint canvas. Color charts are given for each design.". (From the back cover). Maria & Dieter Leipold/ Susan Bickert: Early Toys, Thuringia & Erzgebirge. Swantje-Koehler-Verlag München 2012. from Nuremberg, Thuringia and the Erzgebirge region a nd compares them with many. This book portrays the unbelievable variety of early German wooden and papier-mache toys. VERY GOOD CONDITION. A RARE FIND. You will be the original owner of this item. This is not our doing or our responsibility. Now for the Item. It has 296 pages, hardcover and lots of great pictures of these rare dolls. You will learn about the history of this famous German factory, the Königliche Porzellan Manufaktur Berlin, will hear how they were produced and painted by workers of the KPM factory and will get a specialist of all types of KPM dolls - all sorrowly researched in the KPM archives by Ms Christiane Graefnitz. Belgium’s De Kleine Wereld Museum is recognized as one of the world’s finest museums of beautiful and rare dolls and dollhouses. 9” x 9” softback in very good condition. 164 pages. No materials are included. This is just an instruction book. Price varies depending on country. While it is new and unused there may be very minor shelf wear or a price sticker. Category: Miniatures. This is The Miniature Magazine lot of 4 magazines. All have minimal wear on the covers. Miniature needlepoint rugs for dollhouses. 4USED magazines. normal wear and tear,Sold AS IS. DOLL HOUSE SCALE,1 1/4 "TALL, 2 1/4" WIDE. It never tears up this paper and never gets wet! This book is a specialized book of this category.This is a book that can be obtained only in Japan. There are a lot of illustrations and photos in this book. THIS IS MY BOOK AN INTERIOR DESIGNER DESIGNS SIX DOLLHOUSES. I have never seen any other Dollhouse book like mine. Book 1 contains the Georgian London House Project, The Two Lights Lighthouse Project in Maine, and The Sharphorn Arizona Ranch Project. This is RENWAL WORLD'S FINEST TOYS. Book is in very good used condition. There are no off odors. It is in good condition. Neat book! Designed by Garth Close. The Knob Hill Dollhouse. An excellent reference for the aspiring dollhouse builder! And you can save up to 25%. Book is in Good Condition with rubbing to the cover surface; Spine has tiny creases; Residue from three stickers on the front cover; Price is crossed out in blue ink. Normal wear and tear,Sold AS IS. I am downsizing a large collection so check back often. Talks in detail about every piece in the collection with full color photos of each piece. Condition is very good. Goebel Dealer Letter from President Morris Kule (dated February 21, 1979 - 2 sided). Mimi's Earth Angels: Picture-by-picture pattern, Vol 1: 24" Cloth Doll with basic contemporary clothing, Karres Planning Corp; 1986 1st edition. 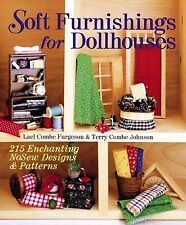 About the Book~ "Use this rich sourcebook to decorate your doll's house in authentic period detail. © Date ~ 2000, stated First Lyons Press Edition. There is a small piece of tape on the top edge and the bottom edge of the front and back covers. I've photographed a couple random sample pages so you can see its contents and condition. Dust Jacket Condition Issues: Dust Jacket has overall wear to cover faces, corners and folds. Edge tear along bottom edge of front cover of jacket. Great reference book for the collector. Signed by the author. Please see pictures for details and thank you for looking. Hardcover book with illustrated dust jacket present, both very clean, dust jacket has shelf wear and extremity wear, slightly faded spine; solid binding; book is immaculate, blue cloth boards for covers; overall condition is Very Good -near Like New. Condition & Grade: VG-, edge wear, tanning to edges, SEE PICS! Multiple art pages can easily be combined because they are light and thin. For instance, two statues require a much bigger box. A RUN will be a collection of consecutive issues with no breaks in between them. (Not candle wax or paraffin wax ) is the best choice by far than any other 'prop'. It does not stain or leave any residue on your floors, walls, or accessories. It's clean, efficient, and sturdy. Miniature spoon is shown on a very small 'butter pat' of positioning wax.